The Department of Automobile Transport was formed by the order of the Rector of ZhASU No. 336 dated 07.08.2002 by the structural subdivision of the engineering-technological faculty of Jalal-Abad State University acting on the basis of the Charter and the Regulations of the Zhagu, and in its practical activities guided by letters of instruction, the Ministry of Education and Science of the Kyrgyz Republic Education Law of the Kyrgyz Republic. The department of “Emergency Protection” was established in 2011 on January 17 by decision No. 4 of the Academic Council of ZhASU. Since the establishment of the department “Autotransport” and up to the present, the head of the cts, i.o. Professor Kambarov Cholponbek Umetovich. By order of the Rector No. 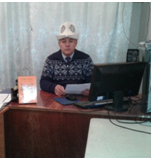 1/15 dated January 18, 2011, he was appointed to the position of Acting Head of the Department of “Protection of Emergency Situations” Ph.D., associate professor Z.B.Shamiev. direction 750500 “Construction” (on the profile of roads and airfields) bachelor. The direction 760030 “Technosphere safety” (on a profile protection in emergency situations) the bachelor. For the department assigned 37 disciplines. Disciplines specialization and professional cycles of the curriculum. The department operates training courses for drivers of category B, C and BC. Qualitative composition: doctors of technical sciences -2, candidates of technical sciences – 2, senior teachers – 2, teachers – 2. Teachers of the department prepared textbooks, educational, teaching and visual aids for the disciplines assigned to the department. When conducting trainings, teachers use visual materials (stands, posters, CDs, video films, etc.). The laboratories of the department are equipped with the equipment necessary for conducting workshops in special disciplines. Research work of students is an obligatory, integral part of the preparation of students of the department. The development of research skills for students begins on the 1st course. Kambarov Ch. U., Mirzakmatov K. Methodical instructions for the implementation of laboratory work on the discipline of traffic management for direction 670300 “Technologies of transport processes” Jalal-Abad-2009. Mavlyanov N. M., Kozubaev M. S., Methodical instructions for carrying out laboratory work on the subject of Transport Energy for the 670300 “Technologies of transport processes” direction Jalal-Abad-2012. Kambarov CH.U. Unaa AoroLoru (Transportation terms) UDC 656 BBK 39.1781.2-4 К65 (book 568 p.) 2010. Kambarov Ch.U. “Zhol aooloru” (Road terms) (book 740 p.) 2017. “On the choice of the form of the output link of the shock MPS” Koshbaev A.A., Ergeshov B.T. JAMOUNUN HARCHYSY, 2017.